We are currently on vacation in a small Massachusetts town where we used to live. We plan to take advantage of the parts of summer we miss living in the city, pools that aren't over crowded, the beach, ice cream stands aplenty and peaceful quiet evenings. How do you celebrate summer? Do you go on vacation? Where? We are still navigating our own family traditions, tagging along with our parents on their annual trips in the mean time. But one thing is certain, we like to be outside and eating simply, where bathing suits are our daily uniform. 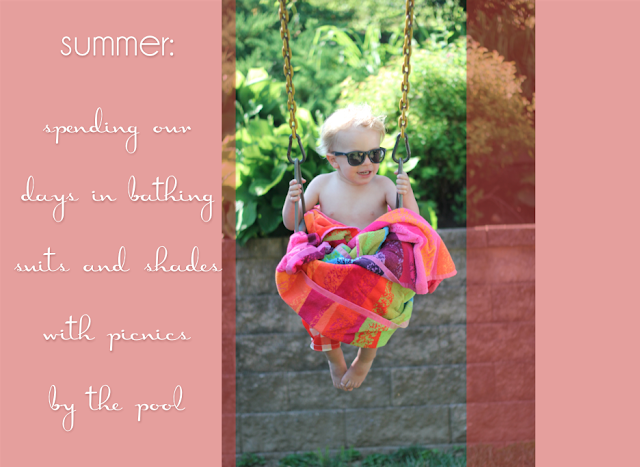 Swimming, sunshine and picnics are our favorite part of summer. This picture was from a visit to my parents' swim club. Behr took a break to soak in the sun and warm up from the cold pool water. Join the Little Days link up. Share a post of what makes the days with your children special. The goal of this link up is to encourage busy mommas to remember the little moments that outweigh the struggles and make it worth the adventure.